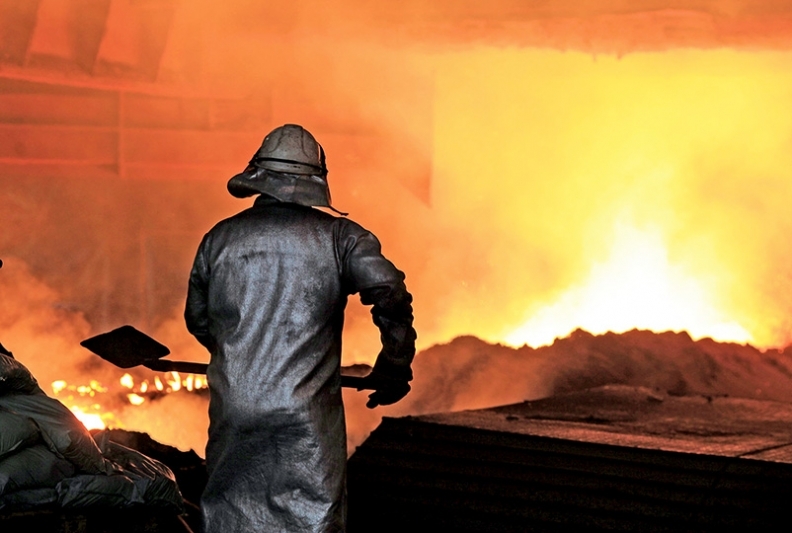 The new investigation will determine whether hot-rolled coil steel from Russia, Ukraine, Serbia, Iran and Brazil "is being dumped and whether the dumped imports have caused injury to the union industry," the EU's executive arm said. BRUSSELS (Bloomberg) -- The European Union threatened to hit Russia, Ukraine, Serbia, Iran and Brazil with tariffs on a type of steel known as hot-rolled coil, highlighting concerns about job losses in the EU industry. The European Commission opened a probe into whether exporters of hot-rolled coil in the five nations sold it in the EU below cost, a practice known as dumping. The EU market for hot-rolled coil, a key product used in everything from cars to construction and manufactured in Europe by such companies as ArcelorMittal and ThyssenKrupp AG, is worth about 10 billion euros ($11.1 billion). This is the latest in a series of EU steel-trade cases that target mainly China, the No. 1 producer of the metal. Chinese hot-rolled coil is the focus of an EU dumping investigation opened in February and of a European subsidy probe begun in May. The new investigation will determine whether hot-rolled coil from Russia, Ukraine, Serbia, Iran and Brazil "is being dumped and whether the dumped imports have caused injury to the union industry," the commission, the 28-nation EU's executive arm in Brussels, said on Thursday in the Official Journal. It has nine months to decide whether to impose provisional anti-dumping duties for six months and 15 months to decide whether to apply "definitive" levies for five years. The case highlights highlights the clout of Europe's steel industry, which has annual sales of 166 billion euros, accounts for 1.3 percent of EU gross domestic product and directly provides 328,000 jobs, according to the commission. The European steel industry has shed 7,000 jobs since last autumn -- including some in the UK where Tata Steel Ltd. plans to sell its ailing steel operations -- and more than 85,000 posts since 2008, Brussels-based trade association Eurofer said earlier this year. In response largely to overcapacity in China, which accounts for about half of worldwide steel production, the EU in April began surveillance of imports so it can urge restraint by trade partners or impose tariffs more quickly should cheaper foreign supplies threaten European producers. The probe into hot-rolled coil from Russia, Ukraine, Serbia, Iran and Brazil stems from a May 23 dumping complaint by Eurofer on behalf of European producers that account for more than a quarter of the EU's output of this kind of steel, the commission said on Thursday.